The shop is where you can buy goods such as special offers, crystals, Gold boxes, Paints, Product kits, Premium Account time, Clan Licenses and redeem Promo Codes. Instead of purchasing items with crystals, you pay with real money. Discounts sometimes apply to Shop Items during Sales. If in possession, Bonus and Discount Cards apply to Shop Items. Special offers are temporary packages or bundles that contain a number of items, somewhat like a Product Kit. They may contain items that are impossible to obtain anywhere else, for example, a special paint. Being the major game currency, Crystals are in high demand and are often bought by players. Bonus Cards give you a bonus of +100, whilst Discount Cards offer a discount on the total price by -25%. When buying crystals, most offers also include a complimentary amount of crystals (this varies depending on the size of your purchase) and Premium Account time (if purchasing an expensive crystal pack). If you need help purchasing crystals, refer here. Containers are purchasable items that, upon opening, can reward you with random prizes, some of which cannot be obtained any other way. After purchasing, they can be found in your Garage, under the "Special" tab. Premium Account offers a variety of bonuses such as 50% bonus to experience points earned in battles and 100% bonus to crystals earned in battles. It also offers the user large long-term advantages and perks. 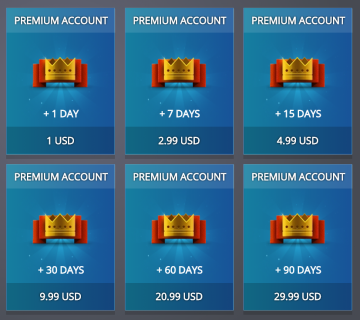 If you need help purchasing a Premium Account, refer here. Purchasing a Gold Box gives you the ability to drop a Gold Box on the battlefield. You can do this to celebrate something, use it strategically or just for fun. The Gold Box will always be worth 1000 crystals, despite whether it is during a special event or not. If you need help purchasing a Gold Box, refer here. These Paints are unique and can only be purchased with real money or with a Promo Code from the shop. Note that these paints do not offer any protections and are purely cosmetic. Buying a Product Kit from the Shop is a great option for people looking to rank up quickly and not waste too much time waiting for their kit to appear in the garage. The kits in the Shop are always available if the player is at the appropriate rank to purchase it. You can also buy exclusive Supply Packages such as the “Supplies 1500 kit” which is available for a discounted price. So far, this only includes miscellaneous things such as the Rename Pass - which is used to change your nickname. The category also contains Promo Codes; and if you need help redeeming a Promo Code, refer here.